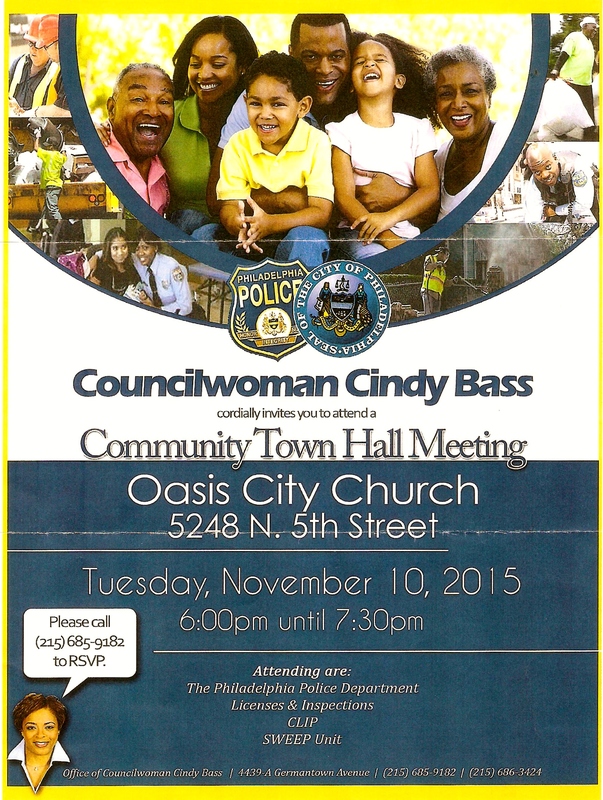 The flyer from Councilwoman Cindy Bass’ office inviting residents to come out on Nov. 10, 2015 at 6 p.m.
Voice your opinions and suggestions directly to city government tonight at Councilwoman Cindy Bass’ community town hall meeting at Oasis City Church. From 6 p.m. until 7:30 p.m. at Oasis City’s 5248 N. 5th St. location, residents will have the ears of the police department, Licenses and Inspections (L&I), Community Life Improvement Programs (CLIP) and Streets and Walkways Education and Enforcement (SWEEP). In City Hall Councilwoman Bass represents district 8, which includes Logan, and has hosted other community town hall meetings. She asks that attendees RSVP by calling her office at 215-685-9182. The Olney Post will cover the meeting, but don’t let the rainy weather deter you; have your voice heard by city employees that work for you. ← “Writers Matter – A Documentary” premieres and spotlights young writers.